A family holiday at the Dolce Vita Hotels in South Tyrol means games and laughter – parents and children will surely have plenty of fun in the Vinschgau District. 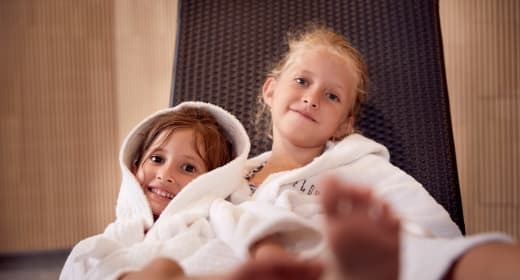 The Dolce Vita Hotels‘ programme for families includes a wide range of leisure activities, special family weeks and professional childcare for children aged three and older. The DolceVita Hotel Feldhof is the ideal place for a holiday with the entire family. The diverse natural landscape of the Vinschgau District is like a giant adventure playground for children. Much can be experienced and discovered on hiking tours, cycling tours und excursions. Many excursion destinations like fortresses, castles and small medieval towns make a family holiday in South Tyrol so attractive. But the popular Dolce Vita Hotels have also quite some indoor summer action to offer: exciting aqua worlds with slides, plenty of space for fun, play and games with the child carers provide plenty of variety. The Feldhof, Lindenhof and Jagdhof Dolce Vita Hotels offer a kindergarten as well as a playroom – even the youngest will be well looked after here. The children get to know their carers during an icebreaker session. New friendships are established quickly. Whether over a tasty ice cream, while painting T-shirts or at the Native American camp in the Dolce Vita garden – everyone is happy on a family holiday at the Dolce Vita Hotels.